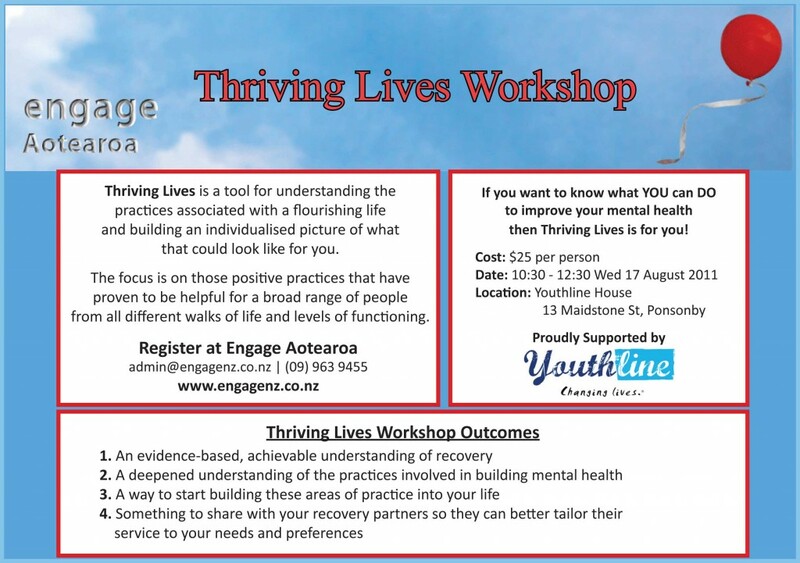 Just a quick update to let everyone know that the fee for the Thriving Lives Workshop on the 17th of August has now been set at $25 per person. There is one FREE space available, funded by an anonymous sponsor. This will be allocated on a first-in, first-served basis, so get in quick, if you or someone you know would like to take part but cannot afford it. There is still a whole month and a half to go until the session, and the workshop is already half-full. This means there are only ten spaces left! You can check out the information sheet at www.engagenz.co.nz/?page_id=96. Contact us to enroll. Don’t forget that people are welcome to enrol as a supporter and take part alongside a client, friend or family-member who may find it easier to attend a group session with a support-person by their side. This would be a wonderful experience for anyone planning on taking part in the ‘Thriving Lives For Supporters Workshop’ on October 12th; by making it work for yourself, in your own life, you will be much better prepared for supporting others to make it work in their lives. The sponsored free space that was available in Thriving Lives Workshop on August 17th has now been filled. There are currently eight spots still available.